How much does it cost to get grillz? Gold teeth is a great investment piece to have in your wardrobe. You can dress it up or down and wear it to all different kinds of events and activities. You can wear grillz to run a simple task or you can wear it on the red carpet, like Katy Perry. Because there are so many different factors that are included when pricing gold grillz, we cannot give an exact cost. 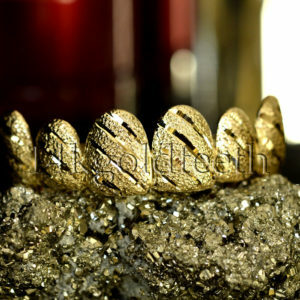 However, at 14kgoldteeth, our products range from as low as $70 to as high as $1,500. The price range varies so much because it all depends on the material type and process time. The more gold the product uses and the more complex the design,the longer it will take for our designers to create the product. That is why the price range varies greatly. 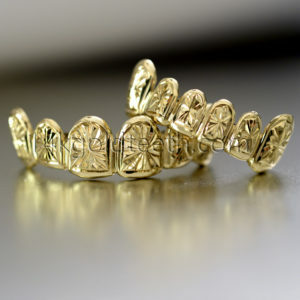 We offer products as simple as a silver grillz to as complex as an 18k yellow gold iced out eight piece. Overall, there are many factors to consider when pricing grillz. It all depends on the type of metal, the number of pieces that customers want their product to have, and the type of designs that they want. For example, an 18k yellow gold iced out four piece product will be more expensive than a 14k yellow gold solid four piece product because the 18k product will use more gold and also uses cubic zirconias. Our gold teeth are more expensive than pre-made grillz because all of our gold teeth are not plated. Whereas other companies sell pre-made products for simple usage, our company creates authentic, real silver and gold products to customize and tailor to each customer’s preferences. Here at 14kgoldteeth, we offer lower prices than any other companies because we want all of our customers to experience their own custom gold teeth at an affordable price. Whether customers choose silver or yellow gold, four or six piece, or solid or iced out, customers have the control of creating their own perfect product at their convenience. Purchasing removable gold teeth offers a permanent look at a fraction of the cost of actual permanent teeth. While other companies overcharge on their products, we do not. With affordable products at the convenience of ordering online and having everything shipped quickly to the door, our customers are ecstatic to purchase their own set of grillz without having to break the bank. Are grillz bad for your teeth? Currently, there are no studies that prove wearing gold teeth is harmful, but there is also no studies that prove that wearing gold teeth for extended periods of time is safe for your teeth. Normally, wearing grillz is not bad for your teeth if you maintain good hygiene. There are many different precautions to consider while wearing the teeth. People should read about the company that they are purchasing from before they actually go through with the purchase. There are many companies nowadays who do not use authentic silver and gold to create the products but rather create products using cheaper alternatives that may harm the teeth. Our company does not use non-precious metals that may irritate or initiate metal-allergic reactions. Our company uses real silver and real gold to create all of our gold teeth, so the products will not harm the teeth. All of our products are indicated with the purity of the gold on the item. There are also other safety measures to consider when wearing grillz. People should not wear their teeth for extended periods of time. Most importantly, people should not wear their teeth overnight as it may cause further damage, especially since some people grind their jaw while sleeping. Grillz should always be removed before eating or drinking because food debris may become stuck inside the grillz and produce bacteria, if it is not cleaned immediately. In addition, people should pay special attention to brushing and flossing as any buildup in the natural enamel of the teeth may become stuck in the grillz and allow bacteria to grow and produce acids. If acid is produced, it may cause tooth decay, if left untreated, and it may also cause oral gum damage. The bacteria buildup in the grillz can also contribute to bad breath, so the grillz should be cleaned daily to remove bacteria and food debris. People should clean their grillz with warm water, a soft bristle toothbrush, and non-grainy toothpaste. It is crucially important that people do not clean their grillz with jewelry cleaners or shiners, as ingredients in those products may be dangerous to ingest. As long as people practice common sense while wearing their gold teeth, it will not be harmful to the teeth. How do grillz stay on your teeth? Some people may think that the grillz will pop right off once placed on your teeth. Our company is a custom gold teeth company, which means that we make custom gold grillz that fit into your teeth perfectly. We provide a molding kit so that customers can create an impression of their teeth. With the finished impressions, our designers create the custom product using the impression of the teeth so the product will fit into the teeth perfectly. The finished product will not be too tight or too loose. It will be perfectly snug in the teeth and it should be comfortable to wear. Our company does not sell pre-made products, so our custom fit products will not hurt your teeth.However, the impression of the teeth is critically important as the grillz will come out perfectly if the mold is perfect, or made correctly. If the finished product does not fit, then the mold was made incorrectly. When putting on the newly created product, customers should be careful and adjust accordingly to the desired fit. When removing the product, customers should not use force but gently remove the teeth, as it will come right off. Customers should pay special attention when creating the impression of the teeth by using and following the directions in the molding kit.